Emma Fitts was the Parehuia Artist in Resident at the McCahon House in Titirangi, Auckland, from April to July 2018. This exhibition of new works that followed her residency:, In The Rough: Part 1 explored spatial interventions by the artist, focusing upon the spaces and environments of the McCahon House and The National’s spaces. Fitts’ installation offered viewers a framework to consider the ways we interact with space and materiality. 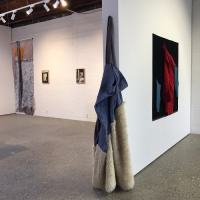 Fabric works were hung from the walls and ceiling, their arrangement making sculptural use of the open spaces of a gallery environment that are often under utilised. The viewer’s path and line of sight was disrupted by Fitts’ hanging works, determining a fluid movement around the gallery and encouraging exploration of the works from all angles. In disrupting the gallery space, Fitts created varied points of contact with the viewer, a closeness between them, the artist and work, one that is not always felt in a gallery setting. Fitts’ works occupied physical and conceptual spaces which provoked a reconsideration of how we interact with the conventional, contrasting narratives of ‘the gallery’ and ‘the home’. While the fabric works themselves hung in The National, her photographs of the McCahon House, (a collaboration with photographer Neeve Woodward), became an equally stimulating, alternate setting for the fabric pieces, with perceptions of the banner-like textiles deeply altered by their positioning in contrasting environments. The National’s simple architectural features and the worn, domesticity of the McCahon House provided divergent contexts for Fitts’ abstracted fabric works, offering an intimate conversation between artist and viewer, questioning and examining perceptions of space and personal engagement with our surrounding environments. Original generation time 1.2692 seconds.